"When the Demand for 'Hate Crimes' Outweighs the Supply…"
Couple in Jonesboro, Georgia claimed the arson of their house was due to a hate crime. Police later found it was insurance fraud and that they had been committing fraud for many years. Black student from Chicago at William Mitchell College of Law in St. Paul, Minnesota sent racist hate mail under the UPS logo from 1996 – 1997 in an effort to extort $500,000 from UPS. Why I Made This Website. The world is the safest its ever been. Bullying and violence in schools is at its lowest levels. I am grateful, as a Jewish guy in my 30’s who grew up in New Jersey, to have lived in the safest country and safest time in the history of the world for people like me. The story tellers on T.V. might benefit from your freight and despair. But it is not based in reality. 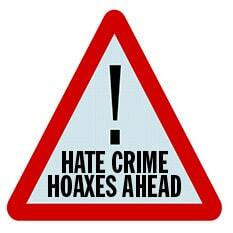 There are real crimes committed by people who are motivated by a sense of hate towards people from other communities. But they are few and far between, and they are resoundingly condemned by pretty much everyone that matters. Don’t let the pessimists mislead you and ruin your outlook on life.